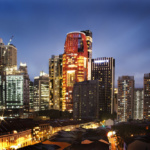 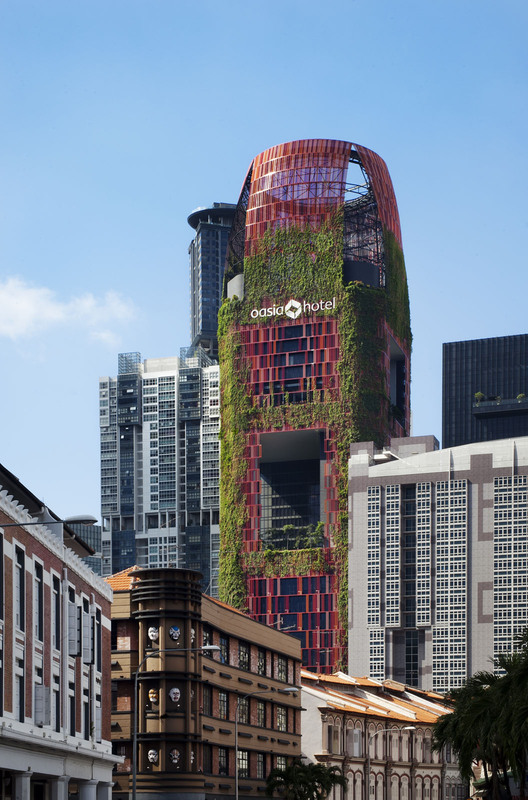 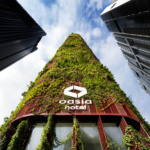 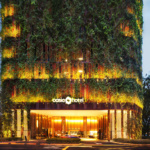 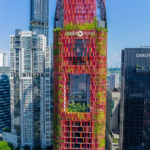 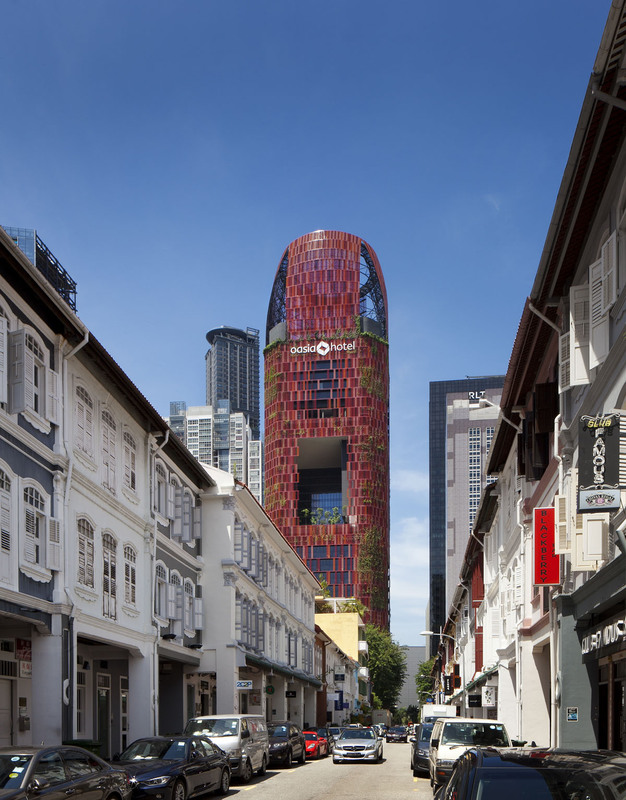 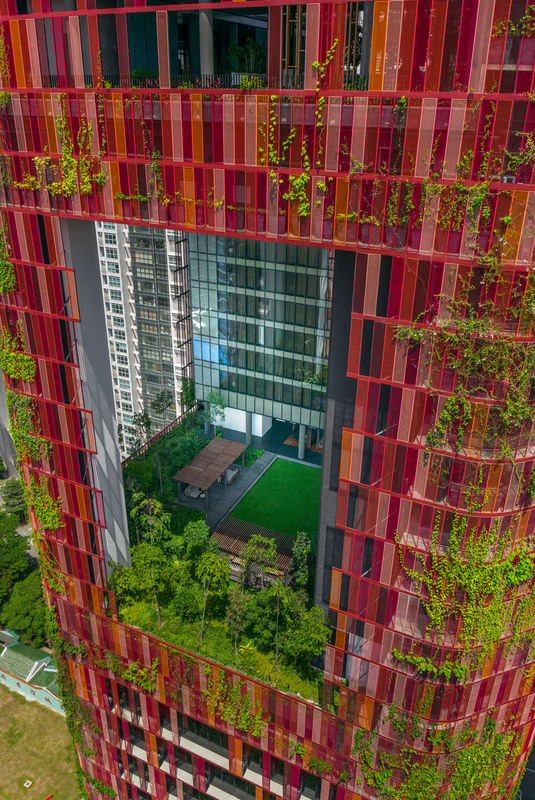 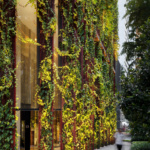 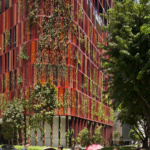 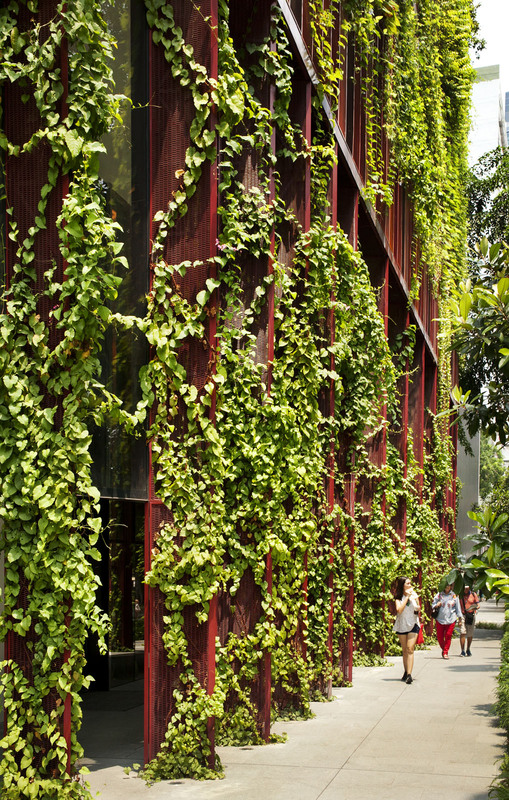 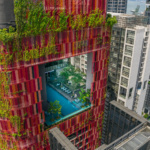 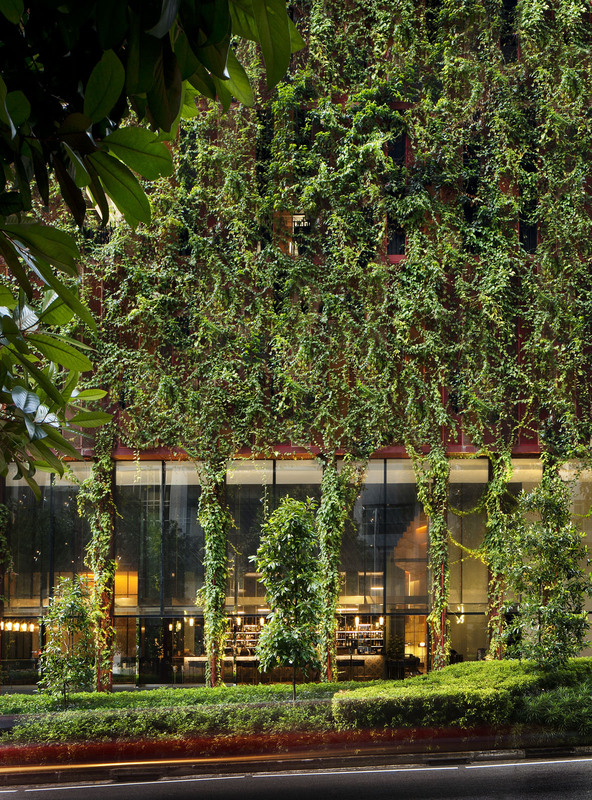 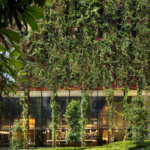 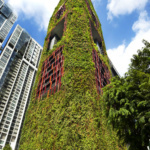 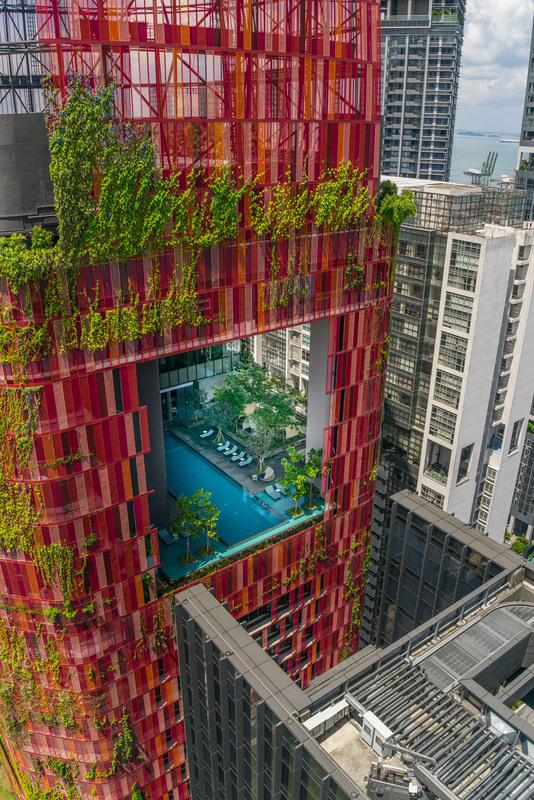 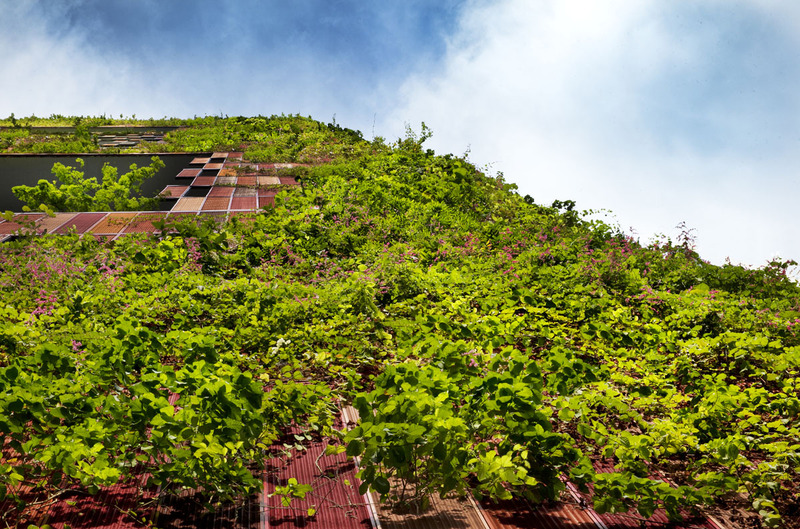 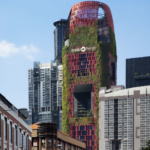 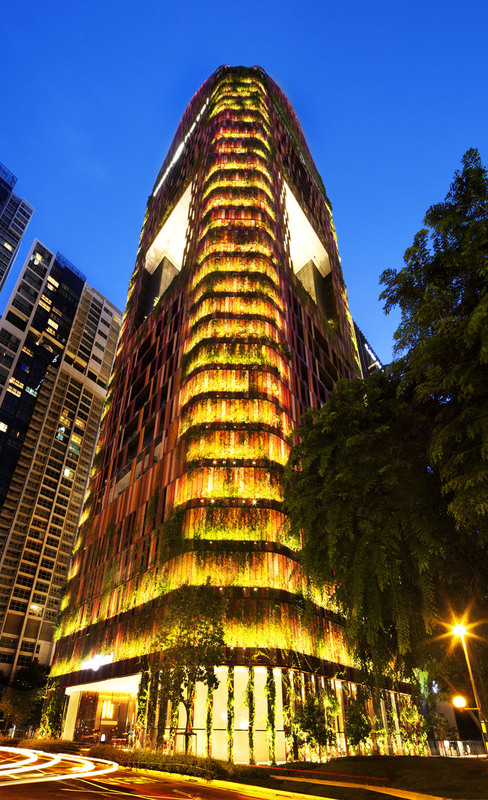 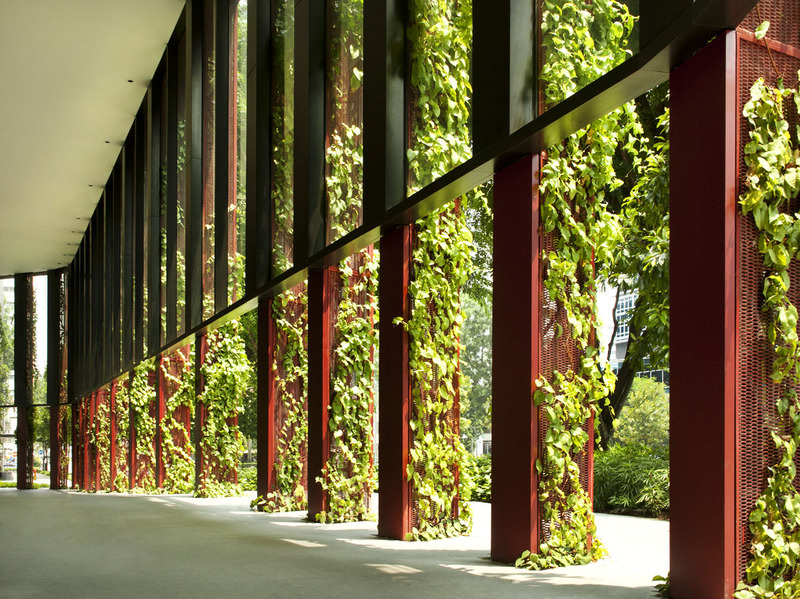 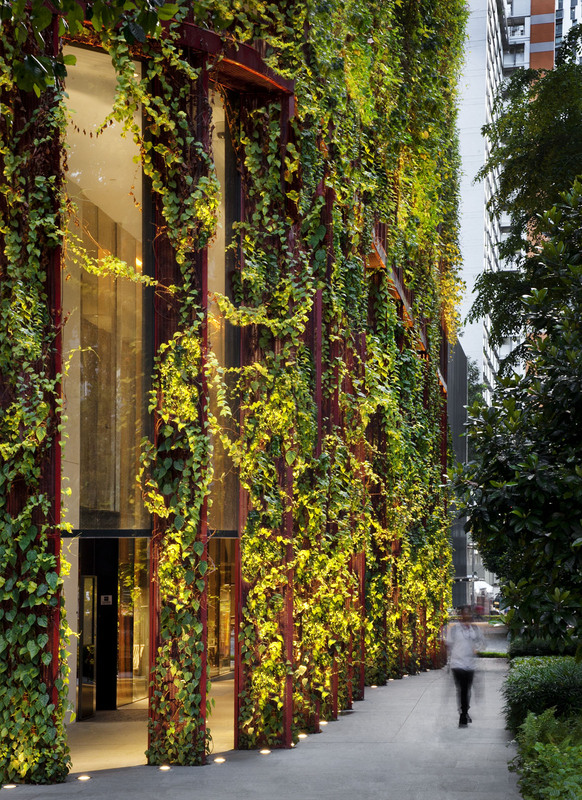 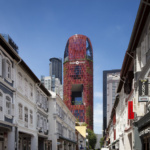 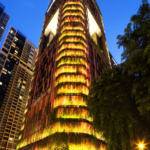 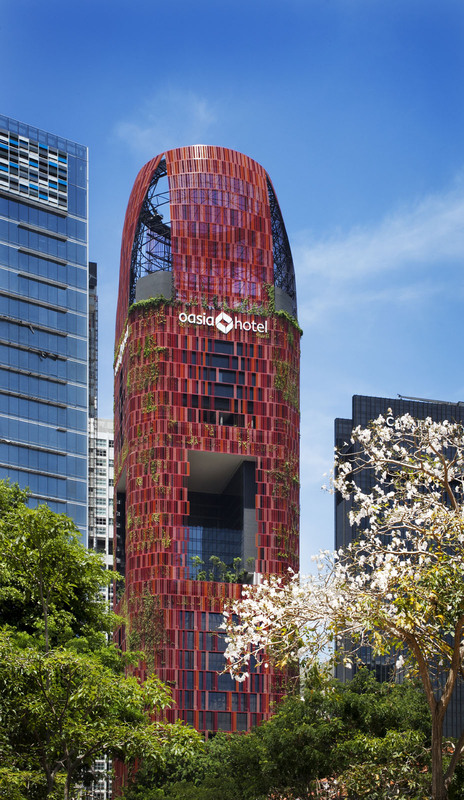 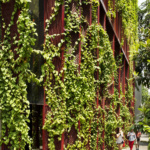 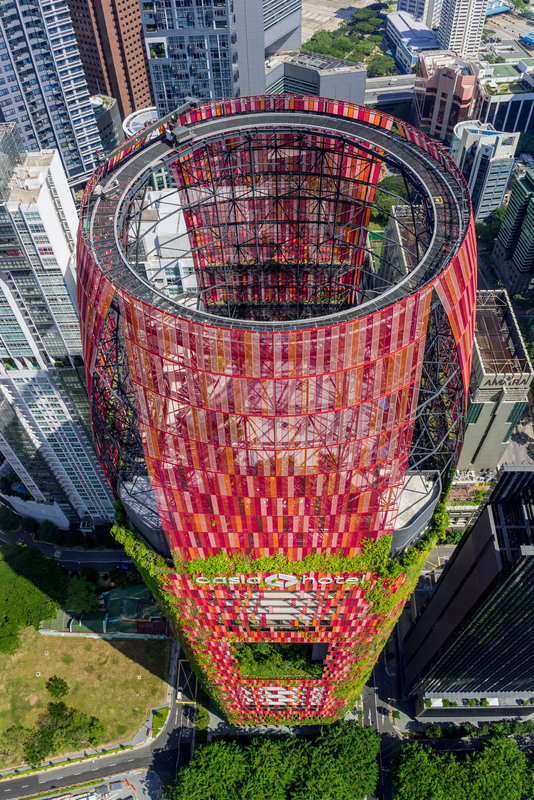 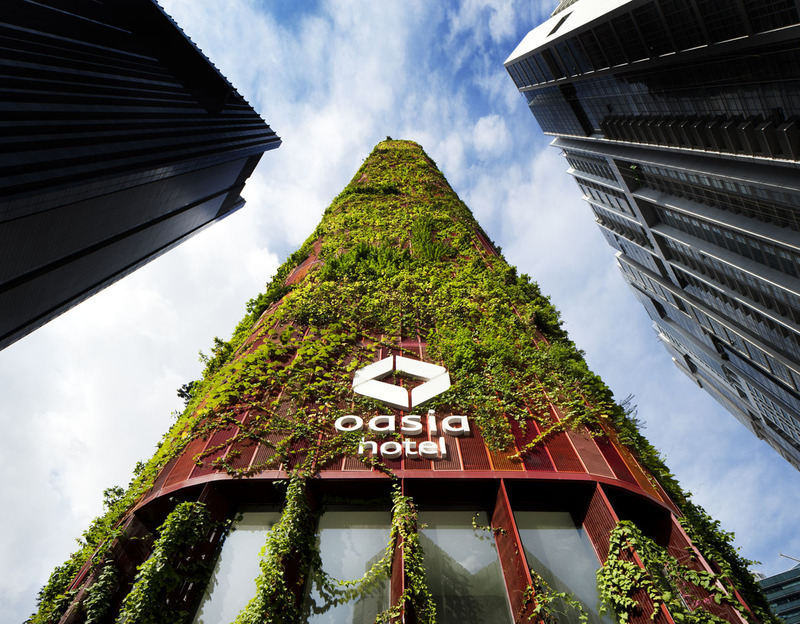 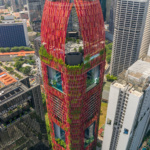 WOHA said the Oasia’s living wall serves as an aesthetic and functional buffer between the surrounding cityscape and the building, creating a layer of shade, absorbing heat, and providing cover. 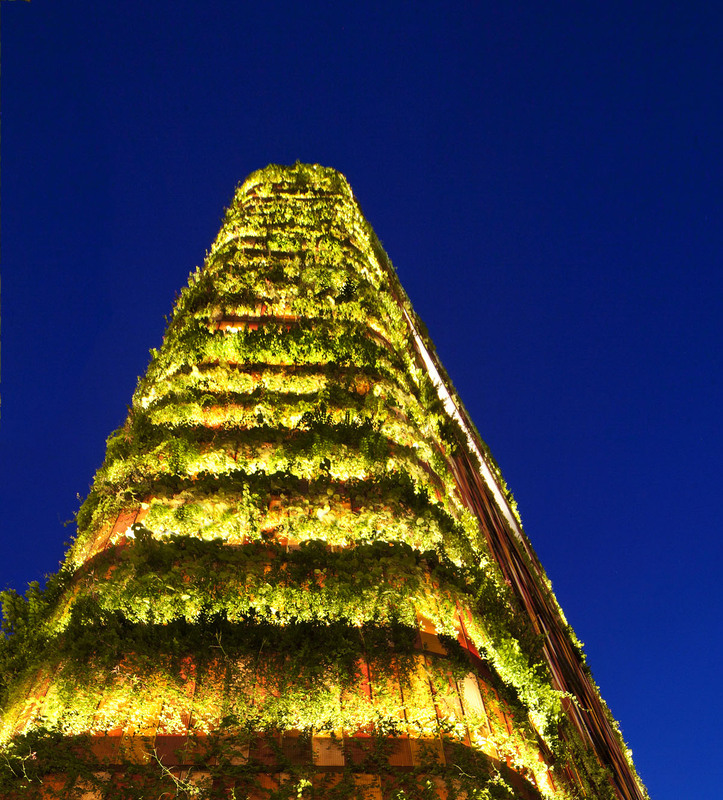 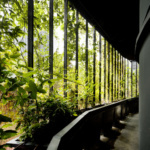 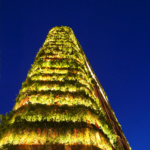 21 varieties of creeping plants were ultimately used on the project to adapt to various environmental solar conditions responsive to light and shade. 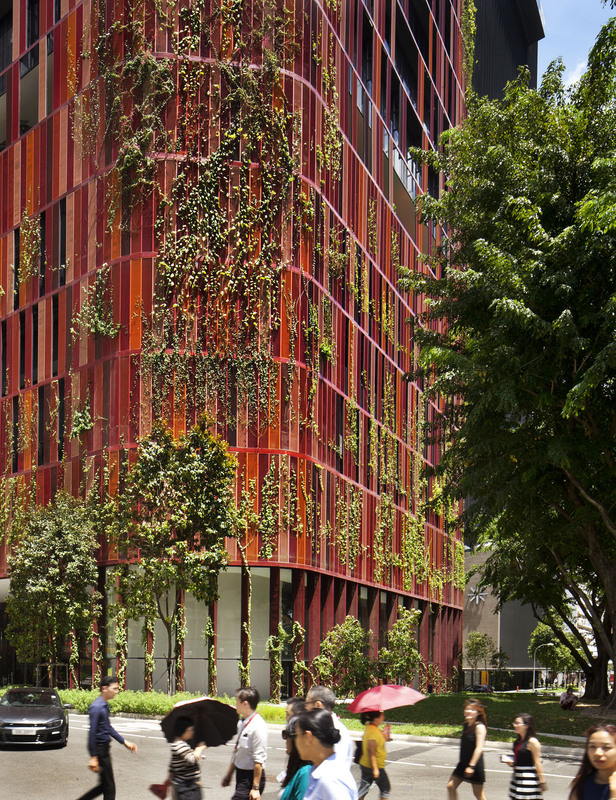 “Some produce colorful flowers that will attract birds and insects at different times of the year. 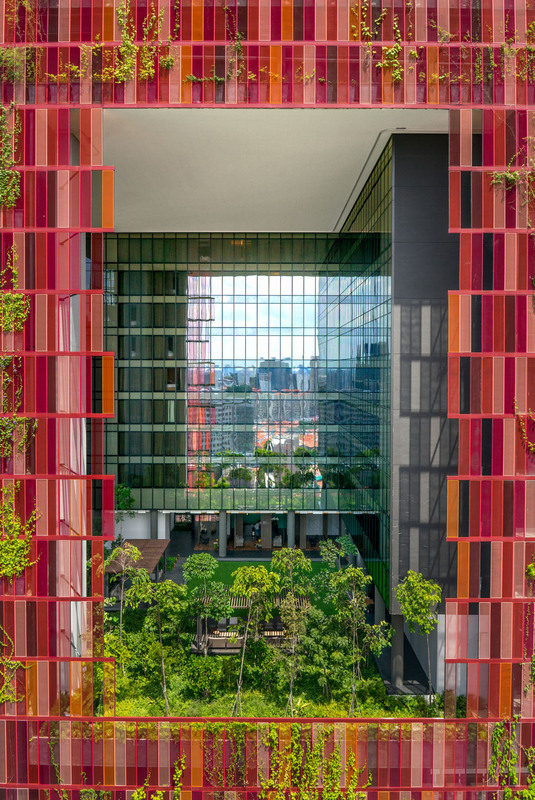 The facade is also extended down to the ground, creating possibilities for small animals (such as squirrels) to climb up the building and use it as a vertical habitat.” Together with 33 different species of trees and shrubs on the sky terraces, there is a total of 54 species within this building that attract biodiversity and support ecosystems. 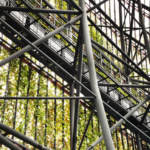 This variety also provides natural resilience against disease and bugs, ensuring a more healthy long-term system. 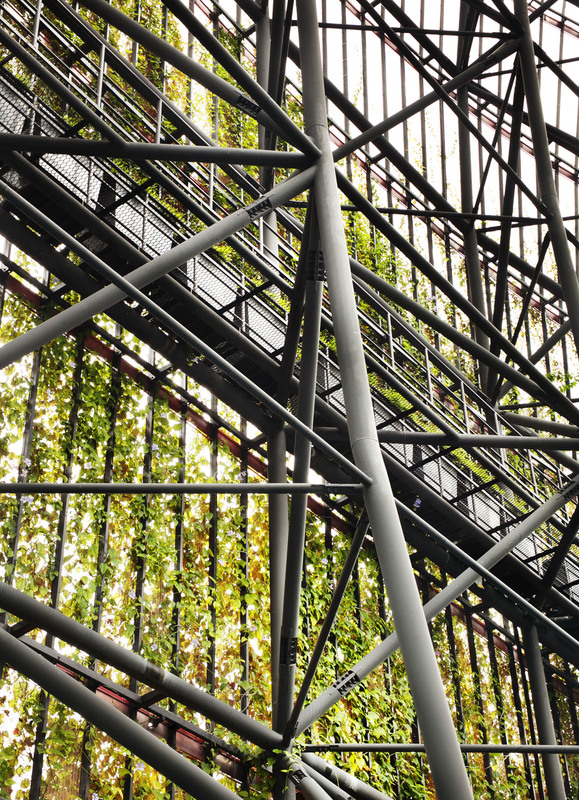 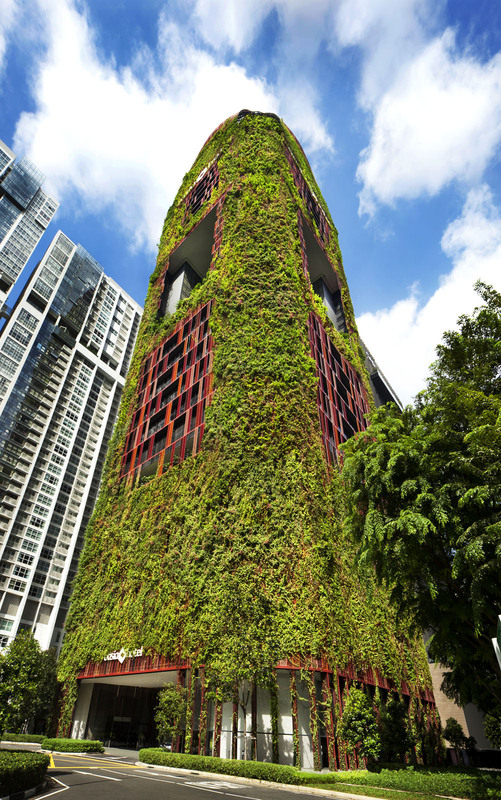 The building’s structure is constructed of a reinforced concrete frame wrapped in a three-layer building envelope assembly: an internal curtain wall, prefabricated fiberglass planters set on an integrated reinforced concrete ledge, and an expanded aluminum mesh that serves as a climbing base for greenery. 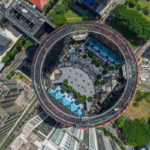 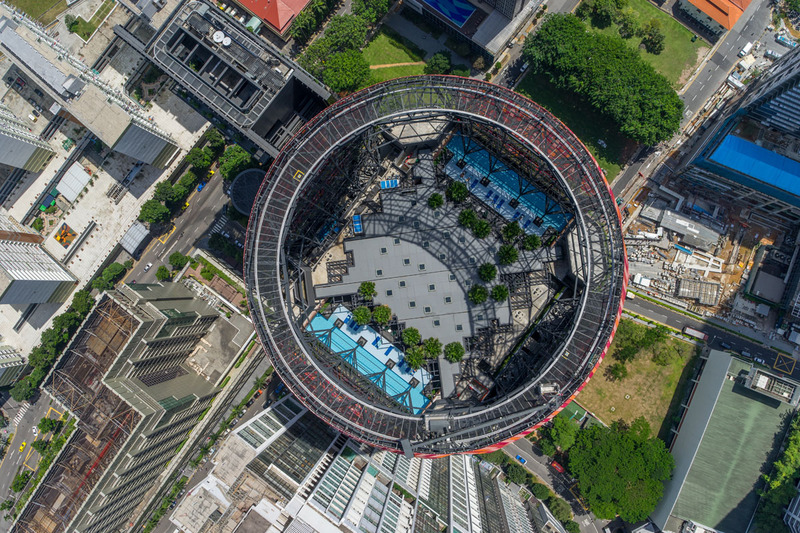 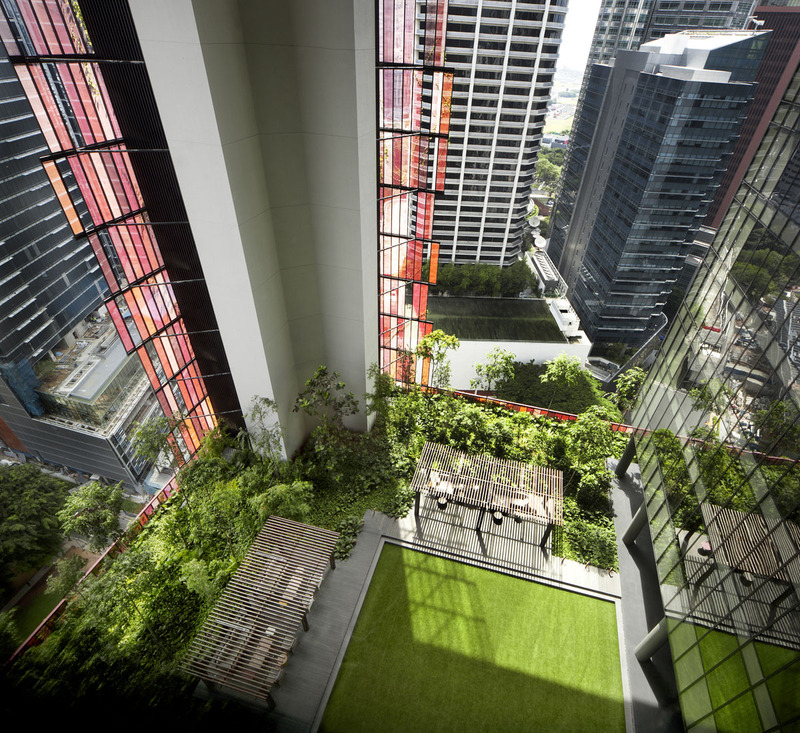 Planters tap into an automatic irrigation system and are positioned within easy reach of an inner ring of maintenance catwalks located on every floor of the tower. 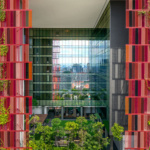 This architecture provides simple, low-tech maintenance avoiding the need for costly specialized care. 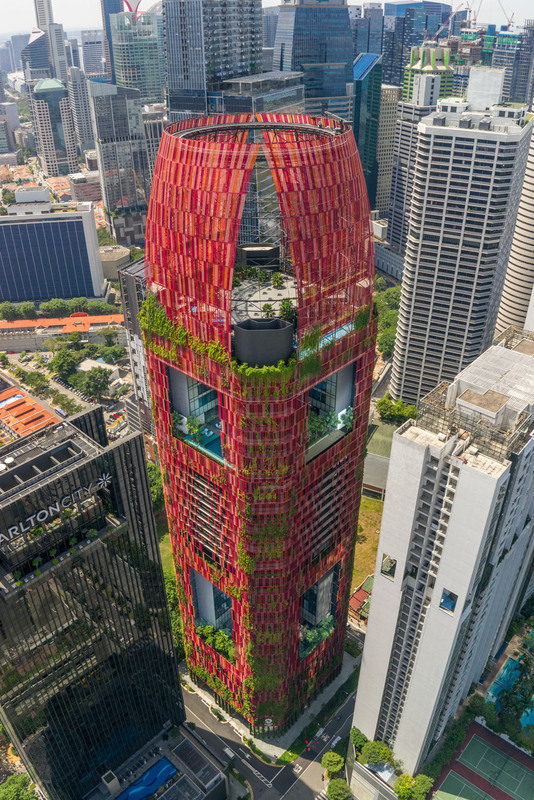 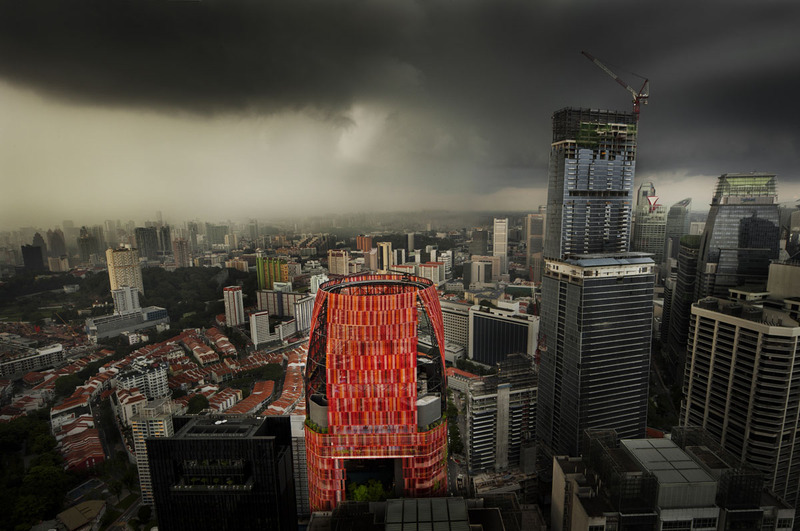 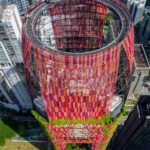 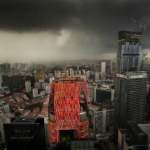 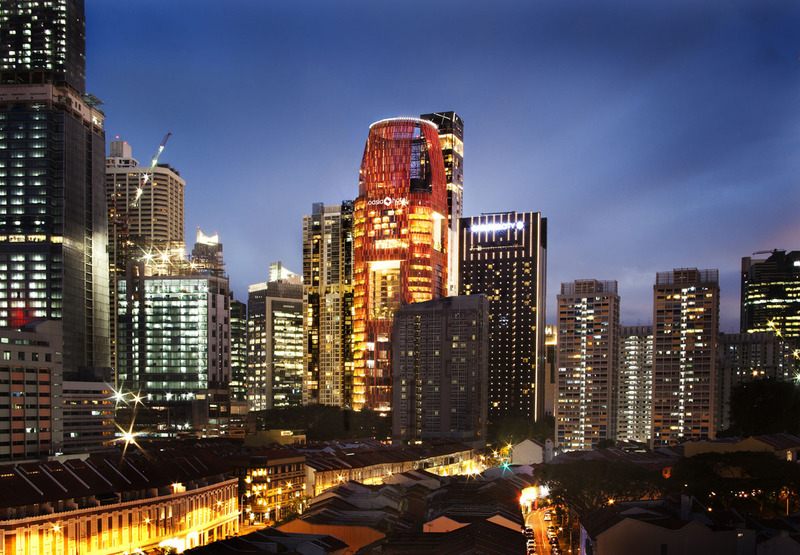 The architects said the programming of the tower is analogous to a club sandwich, a stacked typology where distinct floors of offices and hotel rooms are sandwiched between elevated “sky gardens.” Rather than relying on external views of the surrounding city, the tower reorients views inward to a series of vertical urban-scaled verandahs. 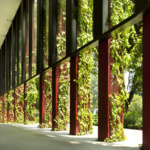 This openness also allows the wind to pass through the building for improved cross-ventilation. 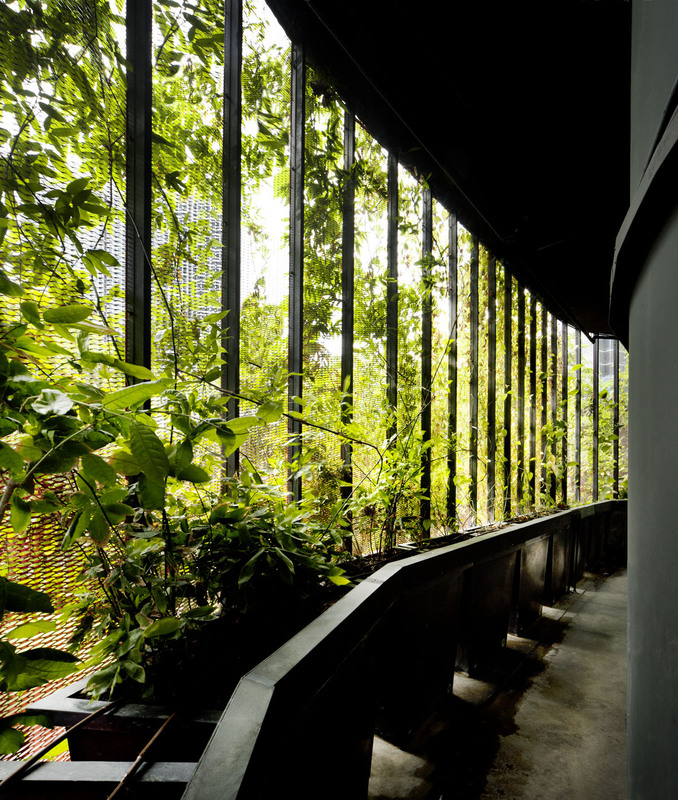 In this way, the public areas become functional, comfortable tropical spaces with greenery, natural light, and fresh air instead of enclosed, internalized air conditioned spaces. 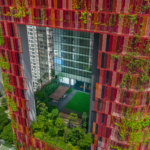 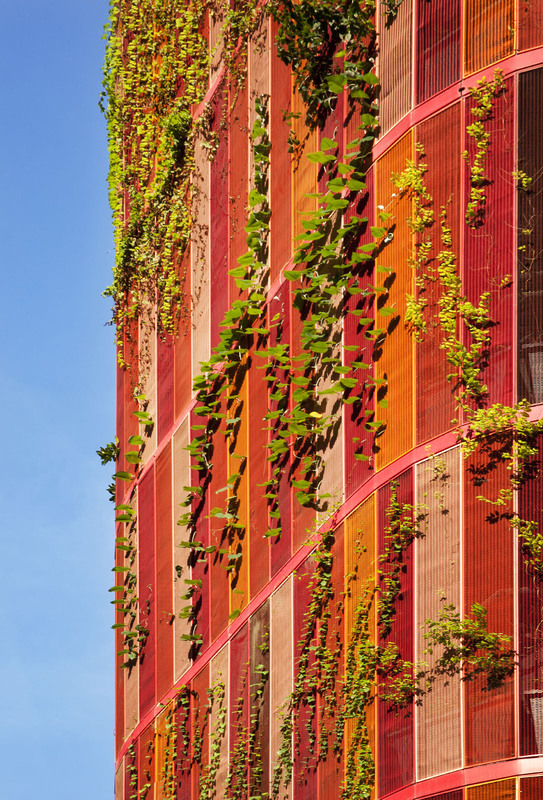 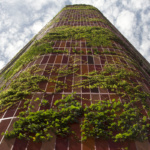 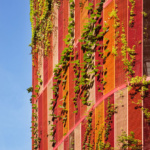 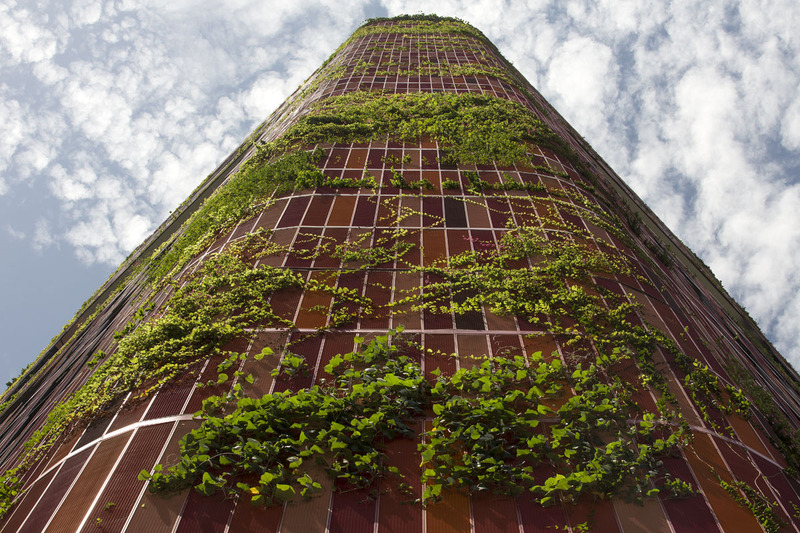 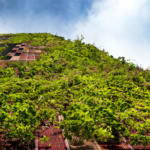 Living wall systems are not a new concept for WOHA, which has previously integrated a system onto a 36-story residential development called Newton Suites in 2007 and School of the Arts in 2010, with green plot ratios of 130 percent and 140 percent respectively. 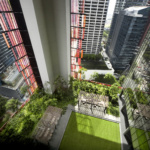 Green plot ratios measure the area of vegetation with respect to site area. 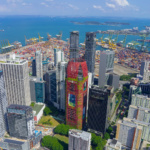 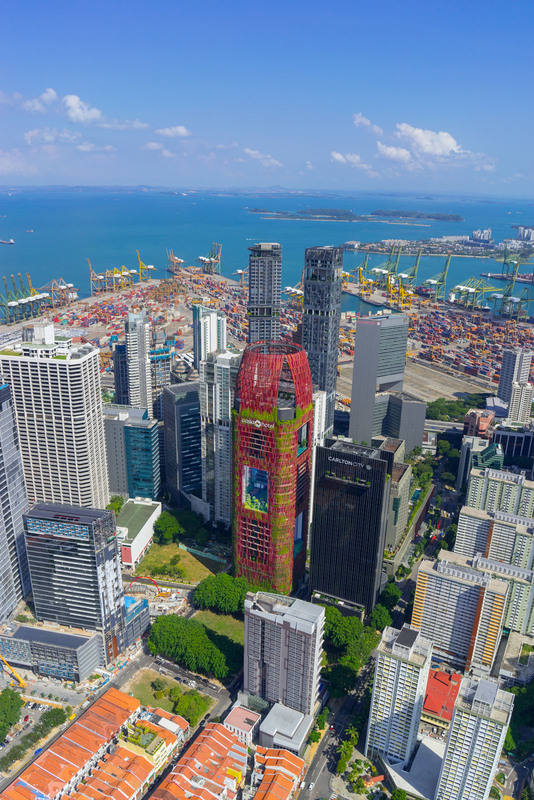 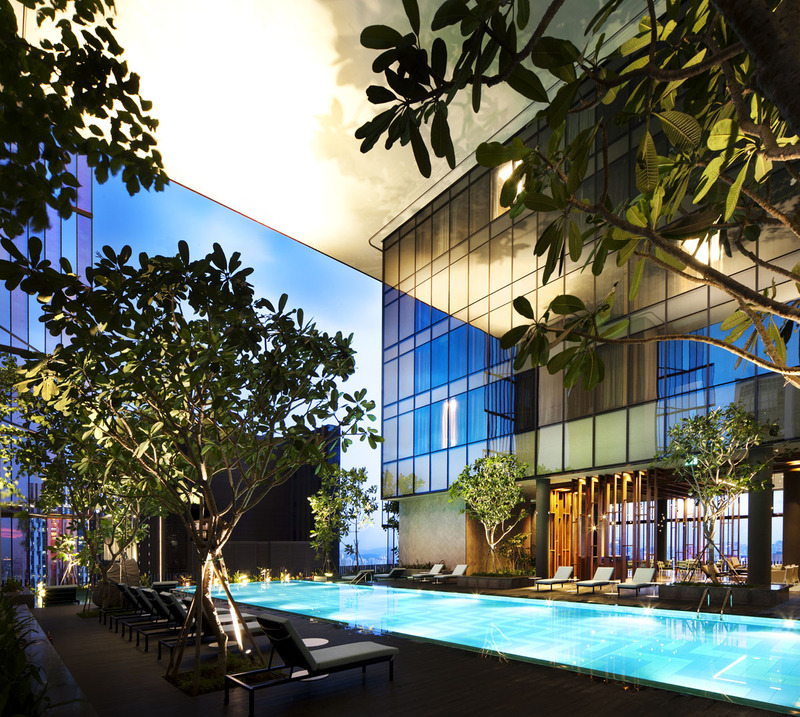 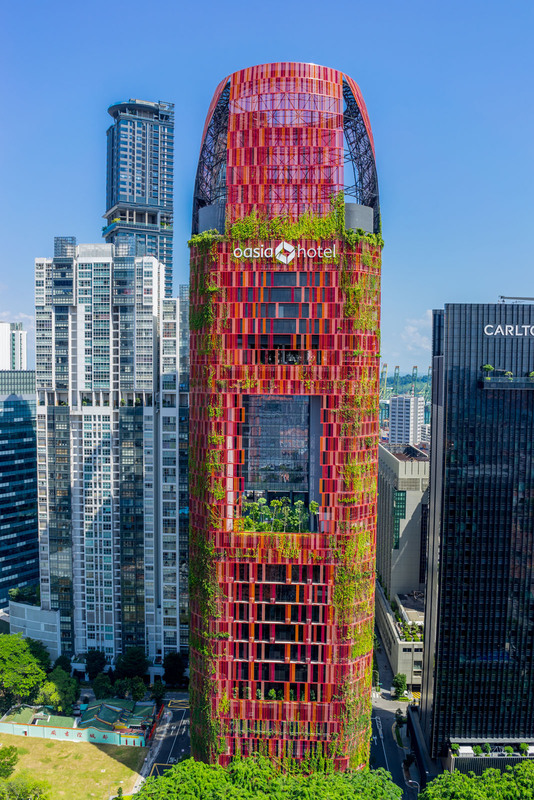 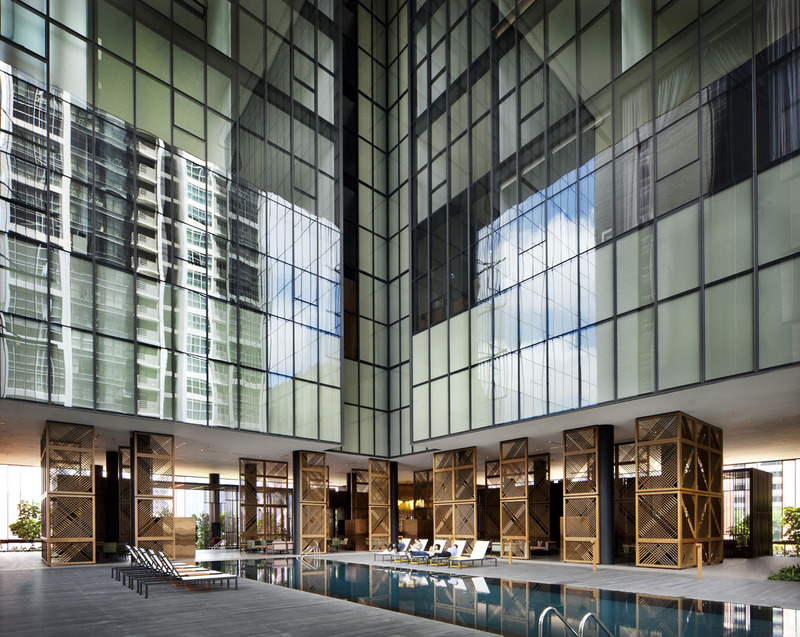 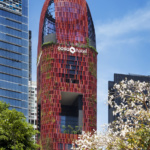 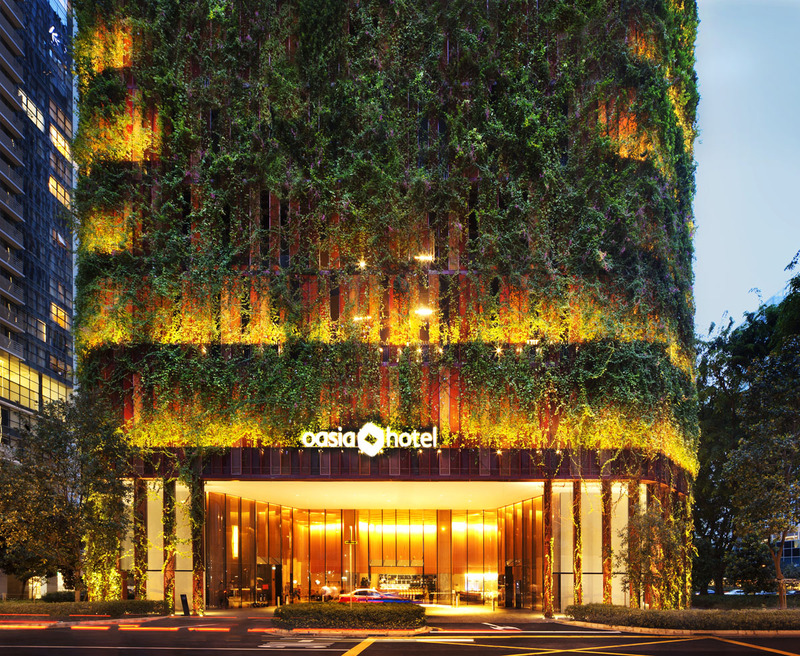 In comparison to these projects, Oasia Downtown has achieved an 1100 percent green plot ratio, thanks for the extensive use of landscaping as an architectural surface treatment, both internally and externally throughout the building.